Police searching for a missing woman have asked people to check gardens, sheds and garages. Leah Croucher, 19, was last seen by her parents on 14 February at their home in Emerson Valley, Milton Keynes. CCTV showed her walking down Buzzacott Lane in Furzton, in the direction of her work, at 08:15 GMT on 15 February. Police have received "a significant number of calls" but have asked people in Emerson Valley, Furzton, Shenley Lodge and Knowlhill especially to help. Thames Valley Police has more than 50 officers and staff involved in the search, which has covered multiple areas of Milton Keynes. Ch Insp Neil Kentish said: "We have received a significant number of calls from members of the public, who have come forward with information, all of which are being prioritised and investigated. "I want to make a new appeal to the public today to check your gardens, sheds and garages, especially residents in Emerson Valley, Furzton, Shenley Lodge and Knowlhill." Leah is described as white, slim, with brown hair at below-shoulder length and she sometimes wears glasses. 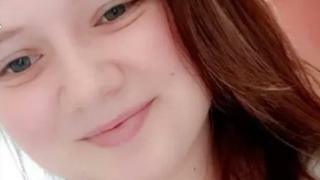 She was last seen dressed in a black coat, skinny black jeans, black Converse high top shoes and carrying a small black rucksack, police said. Her mobile phone and bank account have not been used.